Because this is a very special place to me, I am giving a first to find award of a new Digital Camera, Digitrex # FS-1350Y digital camera to the first person to sign the log book. Fort Negley reopened to the public this month for the first time after 60 years of neglect. 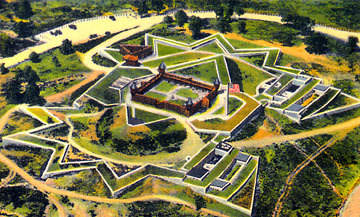 The fort, built in 1862, was the largest and most important fortification built by Union troops occupying Nashville during the Civil War. You could have lived here all your life and never been to the Fort, now is your chance to visit and enjoy the rich history of the area, look at this as an Adventure not a cache hunt. As a very young lad ignoring the signs and gate that closed the fort and visiting it when we were kids. ''Not only did I trespass myself, I trespassed with all my “BUDDYS“,'' It has changed a great deal in 40 years, come get all the history you can stand. All of the Waymarks are in the closes order, and the shortest way around stay on the designated roads and paths. Do NOT go around or over any of the barricades they are there for a reason. Once inside the fort stay to your left. Also please do not climb on anything. As you are walking from one Waymark to another take the numbers and keep a running total until after you have done Waymark #20.